USD/JPY - 111.99.. Despite hitting a 4-week high of 112.10 on Mon, dlr remained on the back foot in Asia n European morning y'day on cross unwinding in yen b4 rebounding to 112.03 in NY morning, however, price later moved narrowly. On the bigger picture, dlr's fall fm 118.66 (Dec 2016) to 107.32 in 2017 (Sep) confirms uptrend fm 2016 29-month bottom at 99.00 has made a top. Despite a strg rise fm 2018 16-month bottom at 104.57 to 114.55 in Oct, subsequent flash crash to a 9-month low at 104.79 in early Jan suggests correction over. 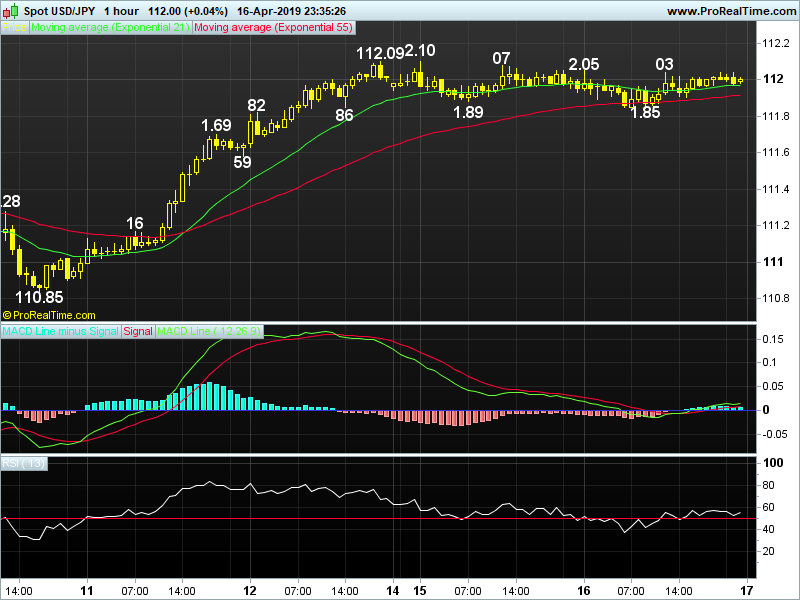 However, dlr's erratic rise to 112.14 in early Mar indicates choppy trading abv 104.57 would continue. As dlr has risen after retreat to 109.71 (Mar low), re-test of 112.14 would be forthcoming next, abv would extend said upmove fm 104.79 to 113. 38 (50% proj. of 104.79-112.14 projected fm 109.71), 'bearish divergences' on the daily indicators should cap price at 114.25 (61.8% proj.). Today, dlr's rebound fm 111.85 to 112.03 suggests pullback fm 112.10 has possibly ended n abv said res extend recent upmove to 112.55 after initial conso- dation, prominent 'bearish divergences' on hourly indicators should cap price below 112.67. Only below 111.58 risks stronger retracement to 111.28.